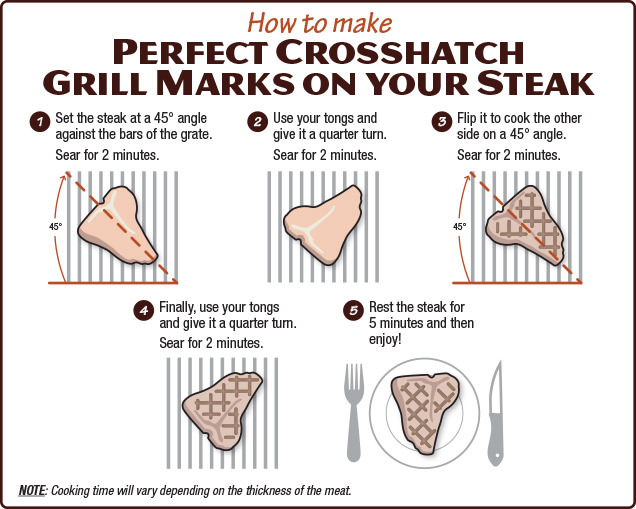 The next time you grill a steak, impress your family or friends with crosshatch grill marks. Not only will the steaks look great, those brown, crusty sear marks are what’s known as a Maillard Reaction and this is what creates that great grilled flavor. Set the steak at a 45° angle against the bars for the cooking grate. Sear for two minutes. Next, give the steak a quarter turn from its starting position and sear for another two minutes. Flip and repeat steps 3 and 4 to achieve the same pattern the other side of the steak. If you are still unsure, we’ve created this visual guide to walk you through the steps. Once you know how to do it, it’s easy to grill a picture perfect steak.